Okay, that’s it for the good Doctor. Before the end of the year, I’ll be wrapping things up for Christmas with my reviews of the last 6 Godzilla movies. And, you never know, I might sneak in a look at a Christmas movie or two just for fun. Meanwhile, I’ll leave you with this teaser…a big change is coming to the blog for 2014! It was a Wednesday night in 1983 when I first sat down to watch this series I had only read about. It was called Doctor Who. I had read some information about it in my Fantastic Television book (yes, I still own that book) and vaguely remember catching a glimpse of an episode as I was flipping the channels (it was the fourth Doctor adventure “Meglos”). Now, I had been a sci-fi fan since about 1970. I had vivid memories of watching the Star Trek episode “Who Mourns for Adonais?” on a black and white TV with my family at the age of 3 or 4. While I enjoyed all sci-fi shows, from Buck Rogers in the 25th Century to Battlestar Galactica to Lost in Space, Star Trek was my first love. By 1983, I had seen the original three seasons more times than I could count. I had seen the two movies, read the comics and novels, played with action figures and become a captain of my own crew in my very own backyard. But by 1983, I was hungry for something new. And just like we’ve seen him do countless times on the television series, the Doctor entered my life. 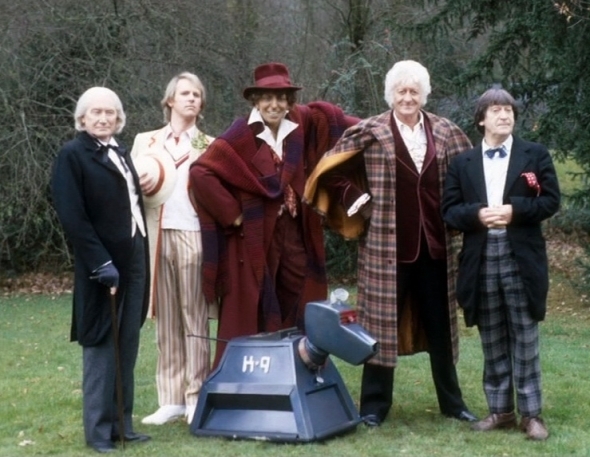 On that night, November 23rd to be exact, I stumbled across what I would later discover was the 20th anniversary special known as “The Five Doctors”. I was hooked. I had a taste and I wanted more. Two nights later, our PBS station aired it again and this time I watched it in its entirety. When I returned to school the following week, I spoke about this cool new show I discovered with my friends Eric and Keith. Eric was intrigued but Keith was already ahead of us. He had liked the show for a while now and was excited to hear that two new Whovians had been born. 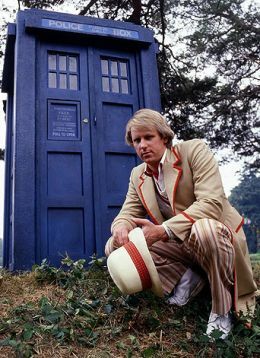 At this time, Peter Davison episodes were airing five nights a week, so I have to say that the 5th Doctor is indeed my Doctor. Over the course of the next three years, Doctor Who was clearly my favorite sci-fi show. 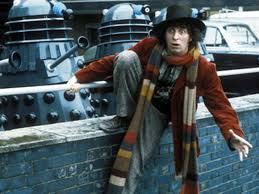 I discovered Tom Baker, which I enjoyed but still preferred my 5th Doctor. My friends and I traveled to the nearby big city of Wichita and spent time at a comic book shop called The Shadow’s Sanctum. I distinctly remember the very creepy owner that lived in an apartment behind the shop. But, he always had a new supply of Doctor Who Target novels and magazines, which were incredibly hard to find in the 1980s. We would attend two Doctor Who conventions in Wichita, called Encounter 8 (after our PBS station, channel 8). There were no guests but they played old episodes. Here is where I watched “An Unearthly Child” for the first time as well as “The Three Doctors”. 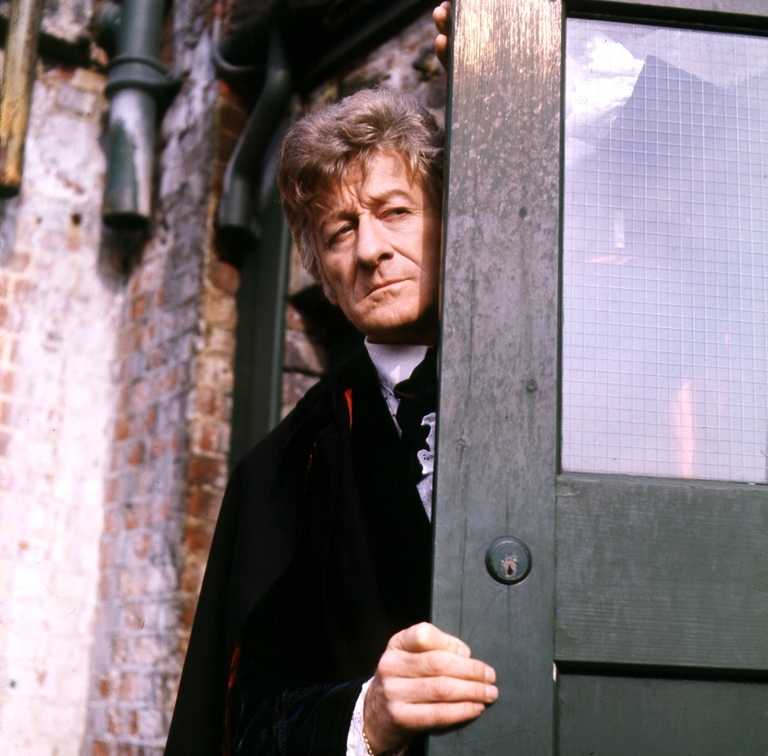 By 1985, I had a growing interest in the 3rd Doctor Jon Pertwee. Some of his episodes were available but not yet in Wichita. 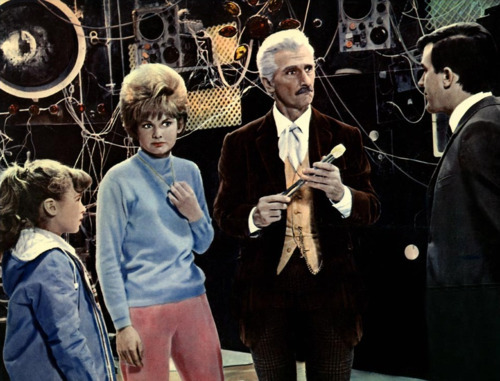 By chance, I had discovered that Doctor Who was airing in Denver on Sunday mornings, which worked out perfectly as our family was going there for vacation in the summer. Yes, that particular Sunday morning of our family vacation, I begged my parents to let me stay in the hotel and watch “The Green Death” while they went to church. They agreed, which was amazing considering they had never done that before (or would again). But I had my tape recorder and with microphone set next to the speaker, I was able to record most of the story. Yes, I recorded every episode of Doctor Who I watched on audio cassettes (along with every episode of Star Trek). At the time, I’m pretty sure everyone thought I was nuts. But I would listen to those episodes in my room in a time when VHS was still too expensive. Ironically, my actions would be vindicated years later when I discovered that fans just like me had done the same thing as far back as the 1960s. In 1986, I went off to college. I was one of only a few people to have a black and white TV in my dorm room. My first weekend there, I watched the complete first story, “An Unearthly Child” as well as the first 6th Doctor story, “The Twin Dilemma”. Needless to say, real college life intervened and my interest in Doctor Who began to wane. Over the next 20 years, there would be peaks and valleys in my fandom. I would record the episodes on VHS, buying random stories as money allowed. I watched the 1996 movie and was saddened when nothing else followed. I would read the books. Then, I would go periods of time without watching a single episode. In 2005, I had heard of the new series. But it wasn’t until I got my first iPod and the discovery of podcasts that my love for Doctor Who would reach new heights. I didn’t know anyone who liked Doctor Who since my friends Eric and Keith in the 80s. But now, I was listening to a show called Podshock and I realized I wasn’t alone. I discovered that my love for this quirky little show was the same as many others. Now, I honestly knew about the global success of the show up to this point but Podshock put me in touch with other fans. And once I watched the episode “Rose”, I was hooked all over again. My love for Doctor Who has never been stronger than it was reborn in 2006. I now own all of the episodes on DVD and Blu-ray. I have posters and books and sonic screwdrivers. I even own a TARDIS trashcan that makes noises (thanks to Santa Claus)! I’ve engaged my very good friends Joe and Phil in conversations as we’ve watched new episodes. I’ve begun the conversion process with my daughter (where is a good Cyberman when you need one). So while the world celebrates the 50th anniversary of Doctor Who today, it is my 30th anniversary with the good Doctor. I will be watching the special later today with my wife, who after 23 years of marriage has finally decided to sit down and see what all the hype about Doctor Who is about. Meanwhile, my DVR is full of anniversary specials to watch. 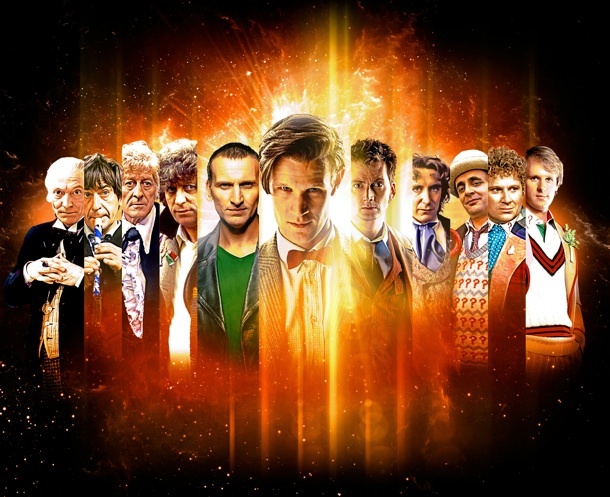 So, Allons-y and Geronimo! On a side note, please take the time to read another great article on Doctor Who at my friend Nick Sauer’s blog, Fantastic Television. He takes a look at the wilderness years between the 1989 cancelation and the 2005 revival. It’s a very fun and informative read! After the moderate success of Dr. Who and the Daleks (1965), it came as no surprise that a sequel was ordered for the following year. Daleks – Invasion Earth: 2150 A.D. would adapt the storyline from the second televised Dalek adventure, The Dalek Invasion of Earth. It would follow the same alternate universe as established in the first film, clearly separate from the Doctor Who television series yet familiar at the same time. Peter Cushing was back as Dr. Who, although his screen time was slightly reduced from the original script due to a minor illness. Roberta Tovey returned as his granddaughter Susan but the characters of Ian and Barbara were now gone. Bernard Cribbins joined the cast as police officer Tom Campbell and Jill Curzon would play the Doctor’s niece Louise. The framing storyline has Tom chasing down jewelry shop burglars and stepping inside what he believes to be a police call box, only to discover it’s bigger on the inside than on the outside. Yes, he’s stumbled into the TARDIS and begins a wild adventure that has Dr. Who (that’s still what’s he referred to as here) taking the TARDIS to a future Earth. Here, the storyline follows the televised version fairly close. The Daleks have invaded and conquered Earth, leaving the remnants of society either enslaved or fighting as rebels. The Daleks are using brainwashed slaves, called Robomen, to control the streets while most of the population is working in a slave labor camp in Bedfordshire. The Daleks plan to knock out the Earth’s core and use it as a flying spaceship to take them to their home world of Skaro (yes, it’s another brilliant plan devised by the salt and pepper pots). The Doctor and his companions work to stop the Daleks by using the Earth’s magnetic energy. The character of Tom is portrayed as much as comic relief as Ian was in the first film while niece Louise could easily have been called Barbara. However, it’s the actor who played Tom that makes it more memorable today. Actor Bernard Cribbins is best known to modern-day Whovians as Wilfred Mott in the current Doctor Who television series. One other notable star was Andrew Keir, who played the character of Wyler. Keir is perhaps best remembered today for his role of Professor Bernard Quatermass in Quatermass and the Pit aka Five Millions Years to Earth (1967), along with several other Hammer horror film roles. Cushing once again turns in a rather lackluster performance but just his presence makes the movie worth checking out. The film wasn’t as well-received as the first. Therefore, plans for a third film, which would have adapted the third televised Dalek story The Chase, were canceled. 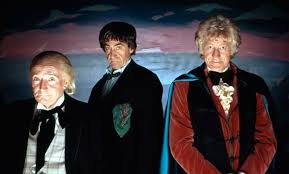 Despite most fans not being overly fond of these movies, they do hold a special place in Doctor Who history and should be watched, even if it’s just for historical reference. Like the first film, Daleks – Invasion Earth: 2150 A.D. is now difficult to find on DVD. 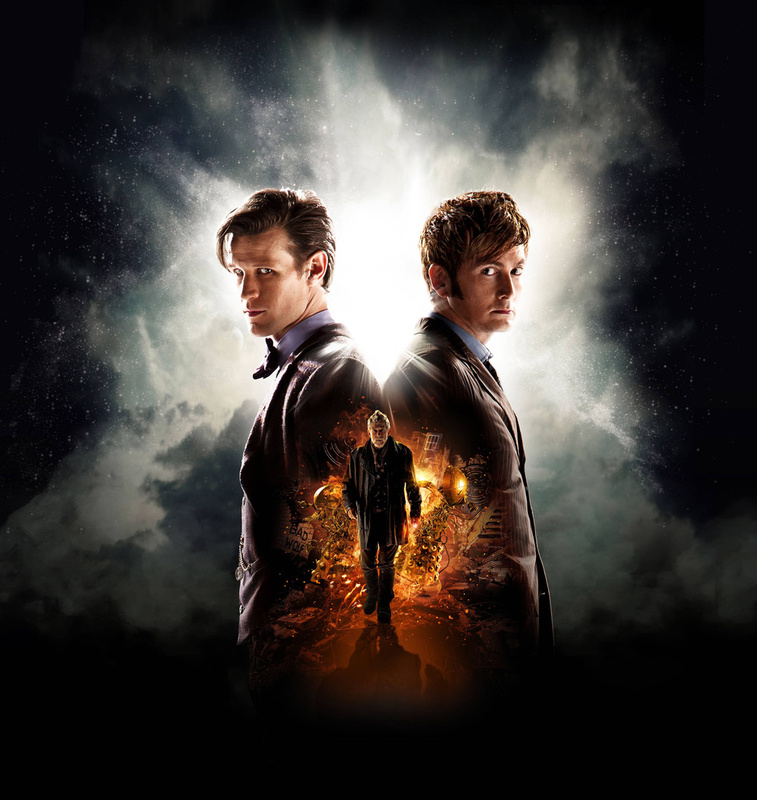 Check out the trailer and start tracking it down as I recommend it for true Doctor Who fan. November 23rd is the 50th anniversary of Doctor Who. I have a week’s worth of specials and retrospectives to catch up on but I certainly plan on watching the special tomorrow. Check back later this weekend as I will wax nostalgic on how I discovered the show and how my iPod played a big part in reviving my love for this British classic. If you are a Doctor Who fan, then you know exactly what happens in just two days. However, if you’ve been trapped for the last 50 years in an ice tomb on Telos, then I’ll just give you a hint. Our favorite Time Lord turns 50 years old on November 23. Well, more accurately the television series Doctor Who does, just how old the Doctor is may never be really known despite constant debates to clarify it. However, in a week where we’ve heard and read all about the 11 doctors and the War Doctor and the upcoming 12th Doctor, it seems nobody has paid attention to another Doctor…Peter Cushing. In 1965, Doctor Who was a bonafide success on the BBC so it should come as no surprise that a decision was made to put the Doctor on the big screen. However, despite thoughts to the contrary, it was a decision early on that any theatrical film would only use certain aspects of the television series. Therefore, Dr. Who and the Daleks was never intended to be part of what everyone was already watching but rather it could more appropriately be called an alternate universe version. Here, the Doctor is actually called “Doctor Who” and he is only an eccentric scientist (he isn’t a Time Lord, which technically we didn’t even know about on the TV version yet). Peter Cushing (Curse of Frankenstein, Horror of Dracula) plays Dr. Who as more comical instead of the irascible Doctor as William Hartnell was playing on TV. His granddaughter Susan is there but younger and played by actress Roberta Tovey. Barbara (Jennie Linden) is no longer a teacher but his granddaughter as well and Ian (Roy Castle, Dr. Terror’s House of Horrors) is just Barbara’s boyfriend and has become a bit of a bumbler. Dr. Who has created a time machine in his backyard called TARDIS and it resembles a blue police box. However, there is no explanation of why he would build it like that. It is bigger on the inside, just like the TARDIS we know but the interior looks unlike anything we ever saw on TV. The story has Dr. Who showing Ian his time machine when Ian accidentally causes it to transport them all to the planet Skaro, although we wouldn’t know that name until the sequel the following year. The story follows the original 7-part television episode fairly close with some differences. Our travelers encounter the Daleks in a city just outside a petrified forest. The planet has been devastated by a nuclear war and the Daleks are the mutated remains living inside a robotic shell. The Daleks here are bigger than what we had seen on TV up to this point. They are also more colorful along with red lights and some even had a claw instead of the usual plunger attachment. Outside of the city, the Thals, remnants of another race but looking more like normal humanoids, still exist but are in search of food. The Daleks cannot leave their city and plan to wipe out the Thals once and for all. However, Dr. Who and his companions work with the Thals to stop the evil plan of the Daleks. To enjoy this film, a Doctor Who fan needs to leave all expectations at the door. With the subtle differences aside, it is a visual feast of 1960s goodness. Bright colors and a breezy soundtrack make for some lighthearted viewing. Granted, Peter Cushing gives a bit of an uninspired performance but it is fun seeing him match wits with the Daleks. And no, it does not pack the punch that the television series did at the time but at just 83 minutes, it moves along quickly in establishing this new Whovian universe. Check out the great trailer and then begin your hunt for the DVDs as they are now out-of-print. 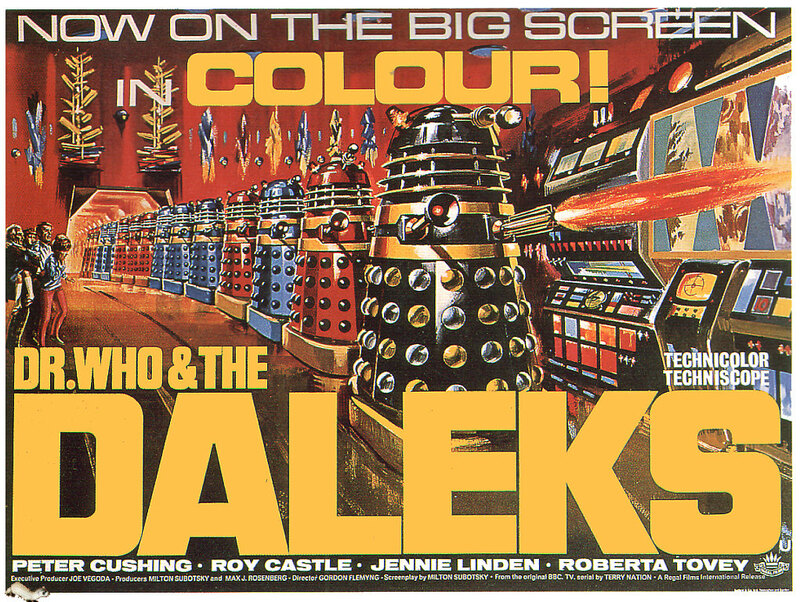 There was a nice box set released in 2001 that includes the 1966 sequel along with a fun documentary called Dalekmania. Prices seem to vary so buyers beware. On a side note, this film actually was released by Amicus Productions but they did not receive any credit. Because Amicus could not finance a film of this magnitude yet, they had to secure financing from AARU who received full credit as part of the business deal. 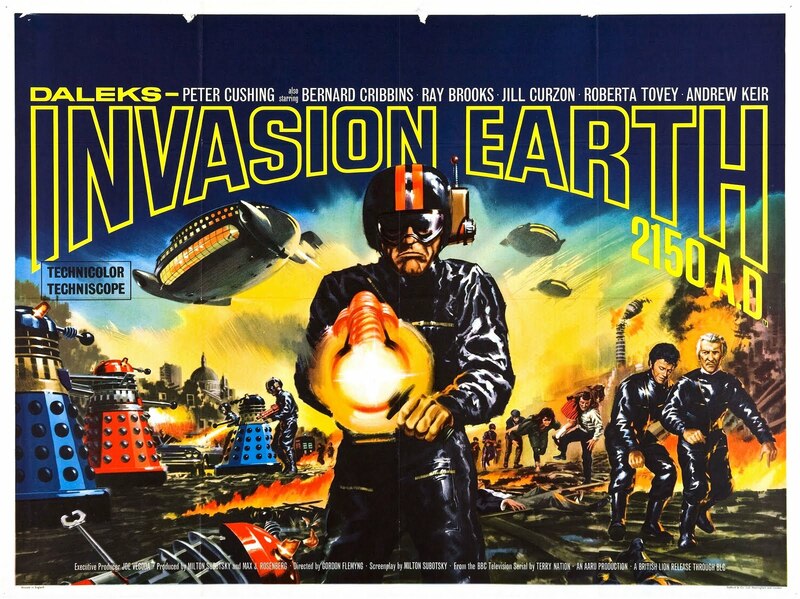 Tomorrow, we take a look at the 1966 sequel, Daleks-Invasion Earth 2150 A.D. as we get one day closer the big 50th anniversary celebration. It’s time for one more Halloween entry to wrap up the favorite month of the year for us monster movie kids. Just a few odds and ends to ramble on about so I can clue you in on some good stuff and warn you away from the rest. Okay, I typically avoid the blind buy anymore. But occasionally, I get sucked in by a trailer or a clip that looks promising. Suffice to say, this one could have been good. The acting wasn’t horrible (Jon Voight hams it up but he’s not bad) and the special effects were better than the average Saturday night SyFy mess (which doesn’t say much). What made this movie a chore to wade through was the script as it was all over the place. Not the worst movie I’ve seen this year but still avoid it. Here’s another blind buy that’s been sitting on the shelf for 5 years. However, this one was actually quite good. 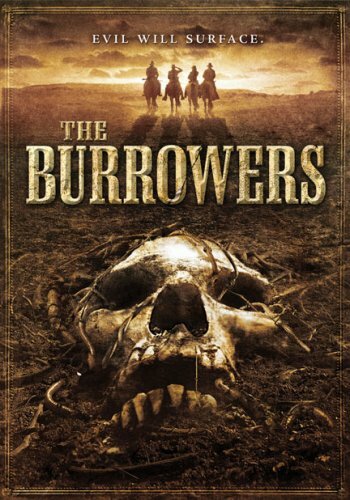 Being a western, it stands out for originality in its setting and it stars Clancy Brown, who I always find entertaining. It’s about a group of men in search of women they believe Native Americans have kidnapped. However, the real enemy lurks below the ground. Well directed, good script, solid acting. It is a little slow at times but definitely worth checking out. Keeping with the blind buy trend, this one has been on the shelf for a year. It was Universal’s veiled attempt at a sequel to their underperforming remake of the The Wolf Man. 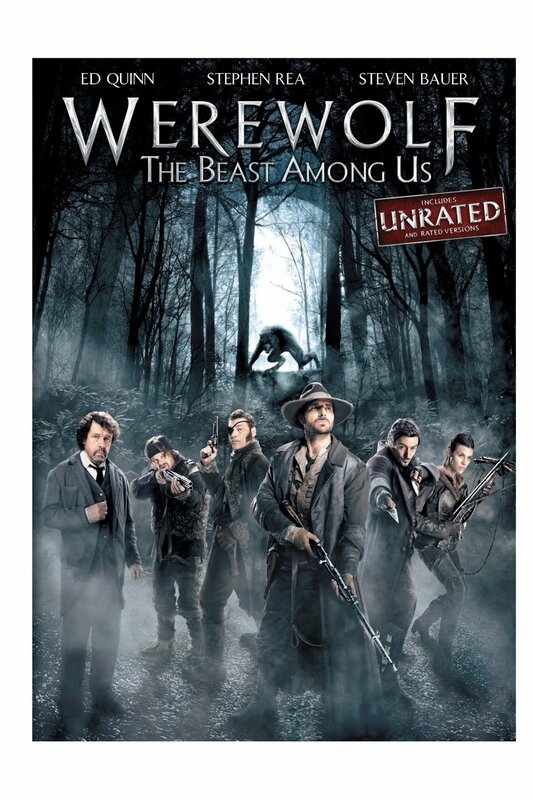 This one is about a group of werewolf hunters who encounter more than they bargain for. The movie looked great and the acting generally solid. CGI werewolves were a little questionable. The first hour of the movie is fairly good but it all seems to fall apart in the last 35 minutes or so. Reveals are made that make no sense and other questions never get answered. Not horrible but you can find better out there. And that’s a wrap folks. 33 consecutive days of posts and I’m pooped. It’s time to take a break. I’ll be back the week of November 18 so we can celebrate the 50th anniversary of Doctor Who. I’m going to take a look at the two Peter Cushing flicks from the 1960s in the days leading up to the big day, November 23. And our month-long journey comes to an end. The pumpkins are carved, the costumes are ready and the candy bowls are full. 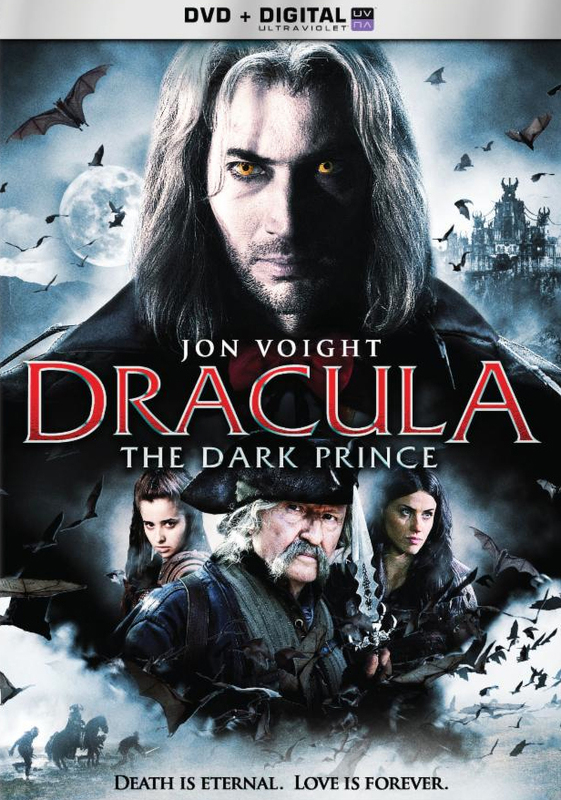 Now, light a fire in the fireplace and sit back for a flick perfect for a chilly Halloween. Today, we go back to Hammer and Christopher Lee in hopes that they can redeem themselves after yesterday’s mess (To The Devil…A Daughter). 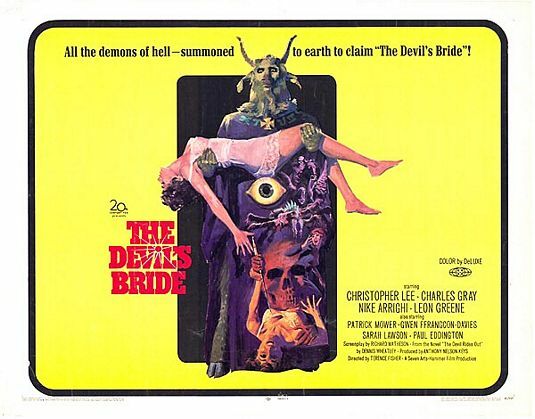 And indeed they do, as today we take a look at The Devil Rides Out aka The Devil’s Bride (1968). Another novel from Dennis Wheatley is converted for the big screen, this time with much better results. In fact, considering this came some 8 years before To The Devil…A Daughter, the success of The Devil Rides Out was thought to guarantee success for another Wheatley novel (oh, how wrong they were). This story was originally considered for production in 1963 but had to wait until the censors eased up on satanic worship. By 1968, Hammer was becoming a little more liberal with their productions, so the timing was perfect. A stellar cast was assembled with Christopher Lee playing the lead character of Duc le Richleau. It was a role Lee stated as one of his all-time favorites. His arch-nemesis is that of Mocata, played marvelously by Charles Gray (Diamonds Are Forever). The story begins as Duc le Richleau is concerned about the odd behavior of a son of a deceased friend. Upon visiting young Simon, he determines the boy has become involved in the occult. Mocata is not ready to let the boy just walk away and a battle ensues between Richleau and Mocata. Before our flick is over, we’ll be visited by the angel of death and Satan himself. 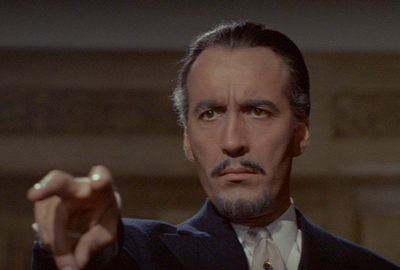 Truly one of the better Hammer horror films, The Devil Rides Out is highly recommended. Watch the trailer and prepare yourself for some fun. Sadly, the DVD is out-of-print, so do some shopping around but expect to pay a little more for this one. I’ll be back tomorrow to wrap things up with some odds and ends. Until then, Happy Halloween!